This is a guest post from our friends at Moving Offices San Diego. Moving and redecorating your home means a lot of stress, work and –money. After you finish, and think you are done, you look outside at your backyard and realize it needs some decoration, too. However, whatever the decoration, it is worthless if there isn’t a good and romantic lightning to accentuate it. No matter how many flower pots, sculptures and garden sets you have, in the warm summer evening, you need a proper lightning. On the other hand, you maybe don’t have enough money to pay for the fancy, expensive bulbs. Don’t you worry, we have something for you. Here are some cheap backyard lighting ideas that you can do easily and not break a bank! This one is the most common way to light up your garden and make the atmosphere cozier. You can buy string lights everywhere, but it is best to stock up on them after Christmas. They are usually on sale as Christmas decoration so you can buy them a lot cheaper. Furthermore, you can find them in different shapes and styles, not only classic bulbs. It is also possible to take ones with batteries, if you don’t have a place to plug them in your backyard. As long as we are talking about the string lights, here is another idea for you. These strings don’t have to be only hung simply above your head. 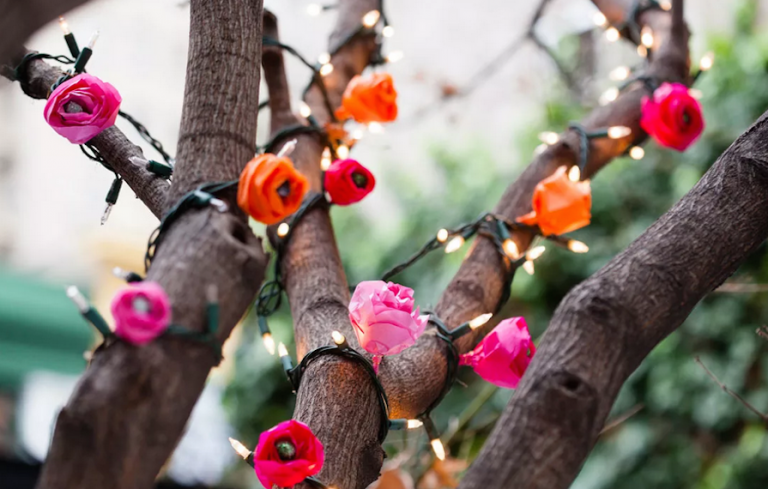 If you have some trees in your backyard, wrap them with string lights. You can do it all the way up to the branches, or make it more interesting and only the bottom, or the half of a tree. Trust us, it can look amazing! Paper lanterns don’t have to be used for Chinese New Year or other celebrations. They are one of the cheap backyard lighting ideas that you can do right away. Get the number of lanterns you need, put them on a string and hang them! It is really something that can bring both romantic and festive atmosphere to your backyard. They also come in different colors and sizes, so you can customize the look the way you want it. As we mentioned, lanterns give a romantic and cozy vibe to any space. Apart from paper ones, you can use old-style glass lanterns to decorate and light up your backyard. This is truly one of the easy and cheap backyard lighting ideas. You can find different style lanterns on the market – those with LED lights, batteries, etc. However, if you have some old ones paint them in your favorite color and put candles inside. They will light up your backyard and make summer nights more enjoyable and cozy. Mason jars are such a cool product. They can be used for ice coffee and lemonade drinks , but also for lightning. With just a couple of more things you can make an effective lighting setup. You can use candles to put them inside, or make your own candles in the jar. However, use it carefully, since this is an open fire lighting. You can also put a short string lights inside and hang them, or simple put them on the table. LED light strips are a cheap and effective solution for any situation. Even though they are usually used in shops, for example, you can also use them in your backyard. The best way to make these lights more effective is to hide them. You can put them below the stairs (along the each step) and therefore make them more visible and safe. Hide these strips behind your plants, and see how your garden comes alive when you light them. Simple solar lamps that you just stick in the ground can be found in any garden/home improvement shop. They are usually very cheap, so you can get a lot of them. You can stick them in the ground along a path, or along the corners of your backyards. Another possible solution is to stick them in flower pots, together with your plants. They charge during the day, and give beautiful lightning during the night. However, these lamps are not usually that strong, so don’t expect them to light up the whole backyard. You think that after drinking that delicious wine you should throw the bottle away? No way! Recycle them and make your own garden torches. Use any of the wine bottles, some torch fuel and a wick and there you have a candle/torch. Fix them onto a wall and enjoy the romantic light they give. However, use them only for outdoors and carefully – for safety reasons. Old tin cans don’t need to be rubbish. You can paint them, and using a nail and a hammer, make many holes on them. You can even make a pattern or draw something. Once the candle is inside, your artwork will provide a beautiful light. However, once again it is not a strong light, but it will give your backyard coziness. They are perfect for those hot summer nights when you want to enjoy the silence of your backyard and have a glass of wine.
. Don’t risk losing or damaging your items, and let the professional moving company help you. Once you are finished, you can use these cheap backyard lighting ideas to decorate your peaceful backyard. Enjoy! Seattle-based Porch.com is a home services platform that helps homeowners maintain their home and get projects done by connecting them with quality home improvement professionals. Porch is available nationwide online and serves as the exclusive in-store resource in over 1,720 Lowe’s stores across the U.S. For more information about Porch, visit  https://porch.com.